Pick Up Fur & Lint With Ease! It’s 'im-paws-ible' to clean fur and lint from your clothes. 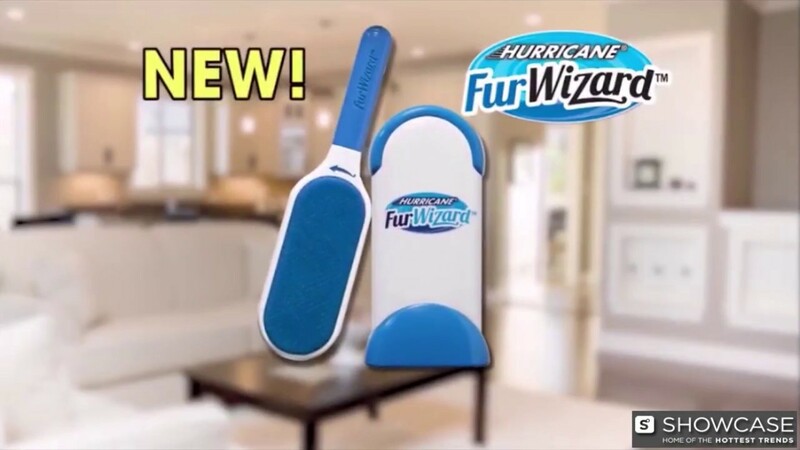 Hurricane Fur Wizard is an extra-large double-sided lint brush that bids 'fur-well' to fur. Thousands of micro-bristles line each side of the lint brush and grab fur, hair, and lint from your surfaces like little fingers. Fur Wizard’s extra large size allows you to capture more fur and lint in a shorter period of time. Your tape lint roller wastes sheet after sheet and refills are expensive. Fur Wizard is a completely reusable pet hair remover. It has a self-cleaning base that removes pet fur, hair, and lint, which collects in a removable base clip. One dip and your Fur Wizard is instantly clean! Remove the base clip to dispose collected hair in the trash. Stop going 'mutts' over pet hair with Hurricane Fur Wizard. Includes Hurricane Fur Wizard Lint Brush, Self Cleaning Base & Mini Fur Wizard With Base. Bought this specifically because my kitty (long hair) would always rub against me or leave his fur all over my clothes or furniture - love it! Really cleans my clothes so I can look presentable when I go to appointments. Glad I got it. Bought this mainly for the self cleaning base but when I actually used it on my couch I was amazed how much it took off and there is 2 sides to use on one go! Love this product would highly recommend it to any pet owner. This product is amazing, with a double coated long haired dog I learned to live coated in dog hair until I tried the Fur Wizard, works like a charm!